Are you looking for a great Deli in Northern Kentucky? Do need some grub for a picnic, or a party sized platter of sandwiches for your next family gathering? Or maybe you are just looking for a new place to pick up groceries and you want a shop that sells lots of local products. Well, Kremer’s Market on Buttermilk Pike is just the place for you! 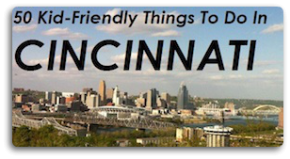 I took a poll on Family Friendly Cincinnati’s Facebook page a few months back asking for a great place to pick up sandwiches for a picnic in the park in Northern Kentucky, and several readers spoke up and suggested Kremer’s Market. Since it’s pretty close to our house, and there’s a park nearby this sounded like the perfect place to stop for dinner! We headed right over to Kremer’s Market and were surprised at the wide selection of sandwiches…over thirty sandwiches to choose from! They have breakfast sandwiches, paninis, signature sandwiches, or you can pick your own lunchmeats, cheeses and breads to have your own perfect sandwich! I had the tomato basil panini and it was scrumptious. Michael loved the signature sandwich that he got as well. The sandwiches were made with fresh baked breads and fresh ingredients. We grabbed some chips & apples (and COOKIES!) and we had the perfect picnic dinner to take to the park. Kremer’s also has hot lunch and dinner entrees that sound amazing as well, everything from fried chicken to steak to roast! They offer a different entree special each day. And they offer a different soup each day as well. Check out their menu for all the details on what this week’s specials are! This is a great option for a night when you don’t have time to cook! Not only can you pick up a sandwich for lunch at their deli, but you can also order party-sized platters for your events. We’ve ordered their pretzel roll sandwiches several times for parties, and they are always a hit….soooo delicious! They have a great deli and meat counter, but are also well known for their fresh produce and the offerings they have on their shelves. Kremers is a small market compared to the big grocery stores we are used to shopping at, but their shelves are filled to the brim with great gourmet items and many many foods from local companies. I love shopping at a locally owned business that supports other local businesses! It’s a win-win! Another section of the shop that I love is their garden shop. In the spring I love to load up on beautiful blossoms in their garden area! Even though I love everything thing about Kremers, if I had to pick one favorite part of the shop it would have to be the bakery! 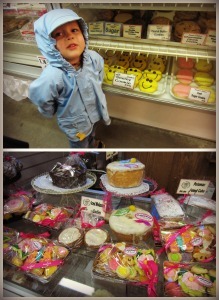 So many great baked good, including cookies from the Bonbonerie! It’s Henry’s favorite part of the shop as well! Not only do the folks at Kremer’s Market make great food to help you out at lunch or dinner time, but they are also super friendly and helpful. It’s a great place to grab a meal or do some shopping! Check them out soon! Kremer’s Market is located at 755 Buttermilk Pike in Crescent Springs they are open Monday thru Saturday 9am-7pm and Sunday 9am-6pm. 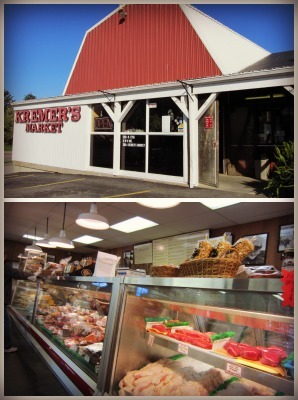 You can visit the Kremer’s Market website for menus, prices and more.